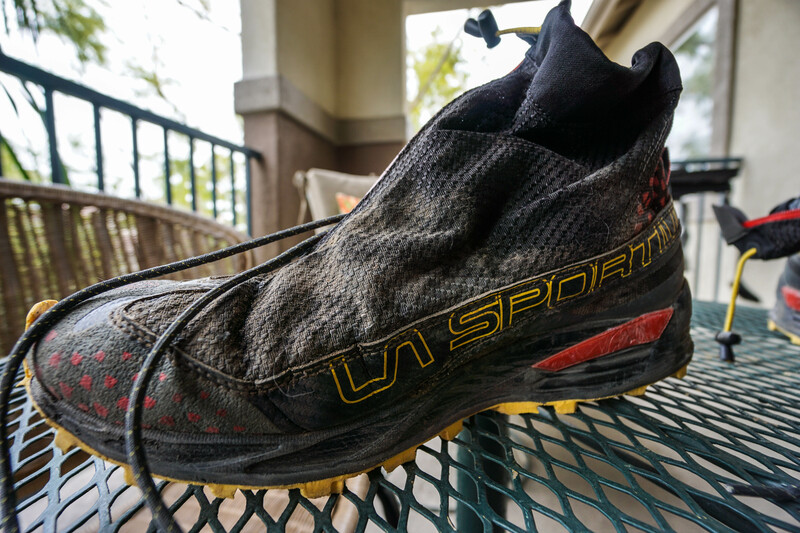 This is a mileage update and wear report for the La Sportiva Crossover 2.0 GTX, if you would like to read my full review, you can click here. For all of my weekend hikes, I like to rotate a few pairs of shoes, basing my decision on the type of trail and weather conditions. Every now again, there is one shoe I long to reach for, and pull out of the quiver regardless of the terrain. The Crossover 2.0 was that shoe for me this Fall and Winter. I bought this shoe for snowy and icy trails that would make good use of the Gore-Tex bootie, but I ended up wearing them on just about every hike I took, even when the conditions would have been better suited for a non Gore-Tex option. The reasons are simple. The Crossover 2.o is immensely comfortable and plush, the bootie does a great job of keeping my feet warm and dry, the Frixion Blue outsole clung to all surfaces while also being very durable, and their light weight and comfort kept me moving on many long hikes. I have logged about 200 miles on this pair and will detail their wear and durability in the post below. The uppers on the Crossover 2.0 look pretty good after 200 miles. Aside from the caked mud and weathered fabrics, they don’t look much different than a new pair. There is no fraying of threads, no seam or crease ruptures, and no major points of trauma. I had a little trouble with the zippers after I took them through some mud and slush one week, but was able to clean them out without any subsequent issues. The rubber toe guards that extend from the outsole came unglued, but I fixed them up like new with a little Shoe-goo. The Crossover 2.0 was comfortable right out of the box, but now having been broken in, the upper feels like a warm sock. I know that Gore-Tex booties can wear and lose their impermeability over time. Having only used these in snow and ice, and not any rain, I can’t attest to that on this model. I can say that they protect from snow build up melting through just as they did from the start. The plush midsole of the Crossover 2.0 has held up very well. I was a bit worried at first as I tend to stamp out softer midsoled shoes in an uneven wear pattern. After about 30 miles of hiking, the soft ride firmed up a bit, much to my liking. I really love the way this midsole is designed, as it offers a ton of versatility. The plastic stabilizer in the heel area does a great job of keeping the shoe stable on varied terrain, without getting in the way. I found these shoes to work very well on uneven terrain, slick ice and snow, soft mud, hardpack, and just about anything else I threw their way. I was a bit worried at first that these shoes did not use a rockplate or firm EVA in the forefoot for protection. My fears have all be washed away after countless hikes over miles of sharp rock. A good test for me is San Gorgonio via Vivian Creek, as there are some pretty rocky portions that can leave my feet feeling beat up. Out of the three times I’ve hiked this trail in the last year, my feet felt the best in the Crossover 2.0. Like most shoes for me, the midsole seems to wear out faster than the upper or outsole. Judging on the feel, I’m probably halfway through the life of this pair, and should be able to get another 200 miles after this review. In my review, I wrote about how much I loved the Frixion Blue outsole of the Crossover 2.0. I’m happy to say that they’ve held up incredibly well. They only have a few chips and edge wear to show for the pounding miles I’ve put them through. I tend to blast lugs off of the outside middle portion of each shoe due to my midfoot strike pattern on downhills. I’ve come to expect all shoes I buy to be worn clean after 100 or so miles in this area. I’ve been very happy to see that this outsole is the exception. The only issue I had with this outsole was a puncture that bit into the heel. It didn’t go clean though, but it did leave a lasting mark and hole. I patched it up with Shoe-goo and have not noticed any accelerated wear in the area. It was a pretty sharp rock that got lodged in, and not too many of my shoes would have held up under such an attack. Still, push through protection of this shoe is definitely on the lighter side in the trail shoe category. A small trade off for superb comfort, grip, and flexibility. In closing, I’m very happy with the Crossover 2.0. I like shoes that cost about 30 cents a mile or better, and these surely fit the bill. I can easily see myself getting a total of 400 miles without much of a problem. As the Spring brings warm weather, I’ll be putting these away until fall, where I’ll eagerly wait to have them back on my feet and hiking up snowy trails.